Here at the First Amendment Center, we launched a report card series this year in the hopes of gauging true threats to the First Amendment. Each quarter, 15 experts from across the political spectrum award grades to the five freedoms guaranteed by the First Amendment. They base their evaluations on events that have occurred in the previous three months. The latest report card shows that over the course of this year, our panelists have grown steadily more pessimistic about freedom of speech. Its grade point average has dropped from a C+ to a C; and while at the beginning of this year the majority of panelists awarded it Bs and Cs, it recently has been earning Ds and Fs. Why the gloomy outlook on free speech? Our panelists pointed to two major factors: controversies involving free speech on college campuses, and controversies involving free speech and Donald Trump. 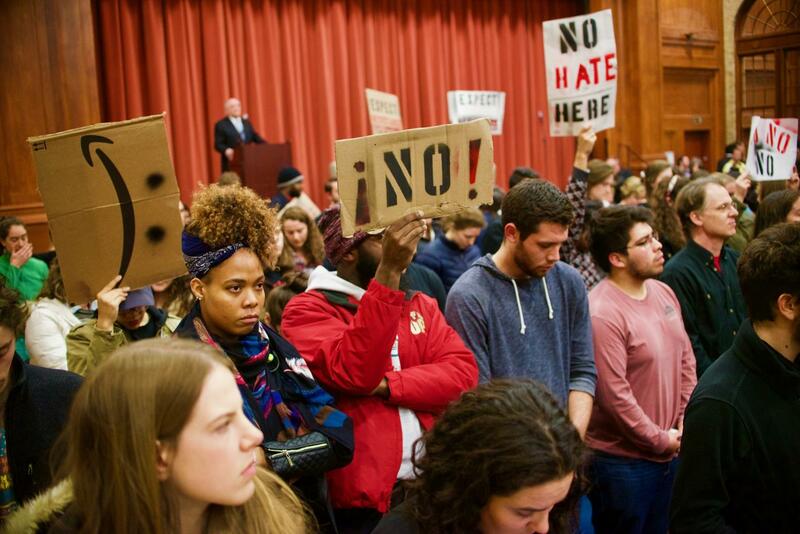 In the past few months there have been several incidents where college students have disrupted events featuring controversial campus speakers. Furthermore, survey results from the Brookings Institute, The Economist, and the Cato Institute indicate that a majority of college students think that hate speech should be censored and that students should be able to shut down an event they don’t like by loudly and repeatedly shouting down the speaker. How much do things like this matter in the long run? For all the news that they’ve generated, President Trump and (most) American college students haven’t actually violated the First Amendment. The First Amendment protects our speech from government censorship and government punishment. For all of his rampant tweeting, Trump has not sought a law making it illegal to kneel during the national anthem, nor has he personally taken any action against Kaepernick. He has advocated for the NFL to fire Kaepernick, but that’s a suggestion, not a mandate. As his press team has pointed out, the president has First Amendment rights as well. The same holds true for college students who shout down a visiting speaker. They have the right to assemble and to protest, and to express their displeasure at a speaker they dislike. These actions are protected by the First Amendment unless they cross the line into violence; the Supreme Court has never specified that they lose these rights once their voices reach a certain decibel. The kind of hostility that President Trump and so many college students display toward speech they disagree with isn’t illegal or unconstitutional. But it’s discomfiting. It demonstrates a visceral fear of ideas, as if it’s not enough to disagree with someone’s opinion, or even vehemently oppose it — instead, they must not be allowed to express it in the first place. It also sometimes feels like a bizarre form of theater. Tweeting about disrespect for the national anthem allows Trump to play to his fan base while avoiding a real conversation about police brutality. Shouting down a speaker like Richard Spencer makes students feel like they’ve defeated a neo-Nazi — but it’s uncertain what kind of impact this has on the white supremacist movement as a whole. Sometimes we forget that freedom of speech doesn’t just refer to the right to talk; it also encompasses the right to hear others speak. The rising antagonism toward speech we disagree with doesn’t necessarily violate the First Amendment, but this attitude can be corrosive to its spirit. Because when speech becomes less about the communication of ideas and more about posturing and showing off your hatred for your enemies, fewer and fewer people will hear it. This entry was posted in Inside the First Amendment, News and tagged First Amendment report card, free speech, Inside the First Amendment by Lata Nott. Bookmark the permalink.